The Watermelon Kingdom is the third kingdom linked to the D Barrel which appears in Donkey Kong Jungle Beat. The Watermelon Kingdom can be accessed by collecting two or more Crests. Donkey Kong travels through this kingdom to fight Rogue-Hog, the ruler of the kingdom. In order for Donkey Kong to finish the levels in this world, he must eat a giant watermelon at the end of each stage. Monkey Fest is the first area of the Watermelon Kingdom. It takes place in and around multiple large trees. This level centers entirely around bouncing off of vines and being tossed around by Helper Monkeys, and it's the first level in which a combo can be held from the start all the way to the finish. Desert Oasis is the second area of the Watermelon Kingdom. As the name implies, the level takes place in a desert oasis. There are many strange, yellow fairies floating around in this level, and if Donkey Kong sends a sound wave toward them, they form platforms and other objects to help him progress. 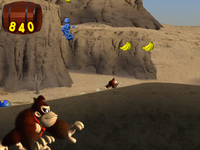 Coconuts also appear in this level, which Donkey Kong can throw at enemies to defeat them. At the end of this level, the Kong must eat the giant watermelon to complete the stage and begin the battle against Rogue-Hog. Afterward, Rogue-Hog, a brown, hog-like creature with a pink Mohawk, must be faced, the arena being a canyon-like area, with a destroyed bridge in the background above. He attacks by throwing electrified coconuts at DK. However, these are also his weakness; by clapping, the coconut is knocked into the air, which can then be kicked at Rogue-Hog, dazing him. Donkey Kong can then jump onto him and punch him. Regular coconuts can also be obtained by knocking at him while he isn't dazed, though only up to three can be obtained. Upon reaching half HP, Rogue-Hog then starts tossing red, spiky fruits at DK. Upon reaching zero HP, Rogue-Hog is knocked unconscious, his body giving off small amounts of electricity. This page was last edited on April 12, 2019, at 13:04.